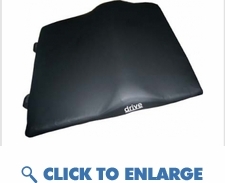 This lumbar back support cushion improves seating posture while providing back support and supreme comfort. The durable masonite board secured on back of foam core prevents hammocking in sling-back wheelchairs. This back cushion conforms to provide support to the lumbar region. The sealed liner protects foam core from moisture. It has a non-slip vinyl back to prevent the cushion from sliding. It also has a non-slip vinyl back to prevent the cushion from sliding. Weight Capacity: 300 lbs. 18 Month Limited Warranty on cover and cushion. Compare to the Jay Basic Back.